A regional daily has welcomed an international event to its patch with a multilingual front page. 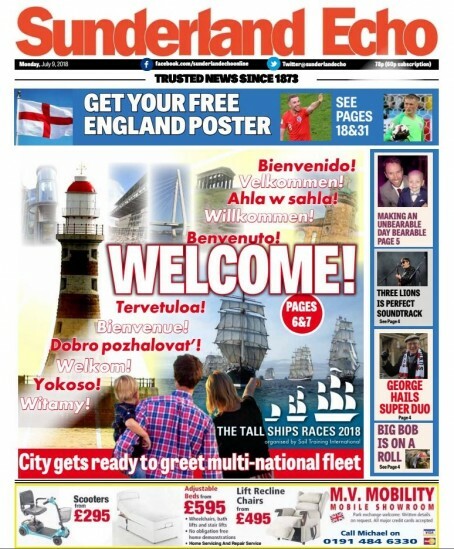 The Sunderland Echo splashed on Monday on the arrival of the Tall Ships Races to Wearside – offering messages of support in 12 different languages. The races are held annually across the world, and this year’s will begin in Sunderland today. The ships involved will initially race from Sunderland to Esbjerg, in Denmark. A second leg will then be run between Stavanger, in Norway, and Harlingen, in Holland. The Echo’s front page featured welcomes in Spanish, Norwegian, Arabic, German, Italian, Finnish, French, Russian, Dutch, Japanese and Polish, as well as English. Last year the newspaper launched a worldwide campaign aimed at promoting the race ahead of its visit to Sunderland.